DNA is the molecule that contains the genetic information, and can be divided into functional units called genes. This is the process of gene expression, and is often referred to as the central dogma. All the information required to make an entire organism is encoded in an important molecule called DNA (deoxyribonucleic acid). This DNA is housed in the nucleus in eukaryotic cells. In fact, almost every cell in a living thing contains the full set of DNA needed to programme the entire organism! We inherit our DNA from our parents, and it gets passed on to our offspring. The DNA does not leave the nucleus, and so does not directly participate in the operations of the cell. However, it is the source of all the instructions required for the cell to carry out its functions. DNA does this primarily by directing protein synthesis, through another molecule called RNA (ribonucleic acid). Proteins are used in a variety of processes in the cell, and are key to catalysing all cellular activities. The coordination of these activities allows the cells to function, and consequentially modulates entire tissues, organs and the whole organism. How does DNA hold the genetic information? DNA can be thought of as a linear set of instructions that the cell has to read and interpret to make all the components required for its functions. DNA is a linear molecule made up of a sequence of monomer units called nucleotides. There are four possible monomers, with different chemical groups attached that make them unique. They are Adenine (A), Thymine (T), Cytosine (C) and Guanine (G). The order of these monomers specifies the sequence of the DNA, and dictates instructions for the cell. This sequence can be thought of as a language that the cell machinery can read and interpret, allowing the production of molecules crucial for its operations. The DNA is not interpreted as one extremely long sequence, instead it is divided into units that can be interpreted as individual ‘words’. These segments of DNA are the genes, which specify a functional product. These products are usually polypeptide chains, which are ultimately processed to become functional proteins such as enzymes. As described in the previous section, the genome (i.e. all the DNA in the cell) isn’t just interpreted as a long sequence of nucleotides. Instead, it’s divided up into functional units of inheritance called genes. The sequences encoded in the DNA sequence within genes specify certain products that perform functions within the cell. The functional output of genes is usually the primary amino acid sequence of proteins. It is important to note that lots of the genome consists of sequences that do not code for proteins. These non-coding sequences were initially called ‘junk’ DNA by researchers, because they thought that this non-coding DNA had no functional role, and was redundant in the cell. However, it was later discovered that these sequences have important jobs in the cell, including coding for regulatory RNAs that do not form proteins but still have important roles in regulating other proteins, turning on/off nearby genes and fine tuning the cellular programmes, and in structural roles. In fact, non-coding sequences make up more than 90% of the genome, so it is unlikely that they were merely ‘junk’. The process of DNA dictating protein synthesis occurs through a two part procedure: (1) the DNA is first transcribed into messenger RNA (mRNA), and (2) the messenger RNA is then translated to an amino acid sequence by the protein synthesis machinery. This is what is referred to as the central dogma. Gene expression, i.e. the process by which genes achieve their functional output, relies on the effective communication of the coded information held in the genes to the sites of protein manufacture (the ribosomes) in the cytoplasm. The two step processes described above are called transcription (where the DNA is transcribed into a molecule of mRNA) and translation (where the RNA is translated into an amino acid sequences). Briefly, the information contained within a gene is transcribed into an mRNA. The mRNA can exit the nucleus holding the information contained within the DNA sequence. The mRNA is used as a template by the ribosomes to create an amino acid chain, which is further folded and modified to become the final protein. An obvious question is why this cannot be simplified to one step? One explanation is simply the fact that the DNA is stored in large complex moleculesthat cannot leave the nucleus because of their size and structure, and thus having a small ‘translatable’ molecule such as mRNA to be able to carry this message to the cytoplasm is a way around this. Secondly, the DNA is a crucial molecule for the long term survival and propagation of the cell, and is therefore kept safe in the nucleus. If the DNA had to leave the nucleus every time a protein was to be made, the risk of damage occurring to the DNA is high. 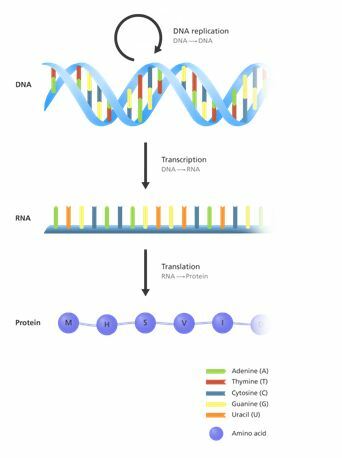 The following sections will cover the DNA molecule and its transcription and translation in more detail.